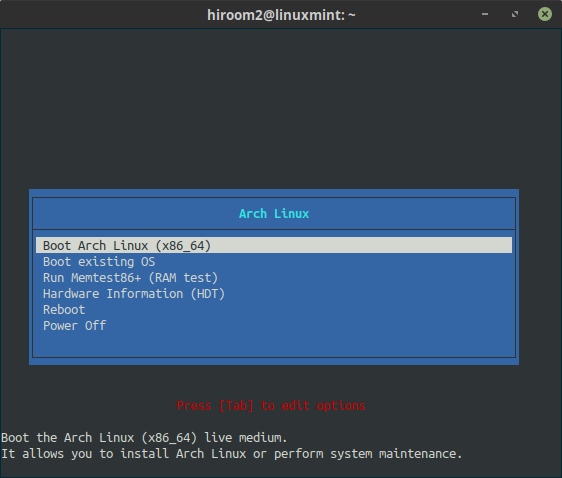 This article will describe installing ArchLinux. 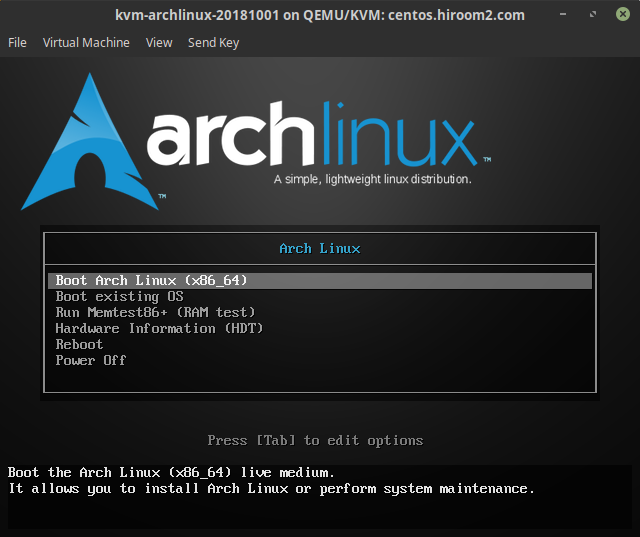 Download archlinux-2018.10.01-x86_64.iso from ArchLinux download page. LiveDVD will display the following menu. 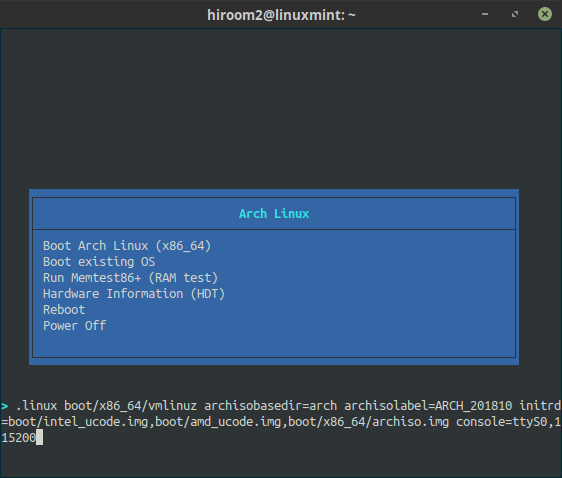 Press ENTER key at "Boot Arch Linux (x86_64)". 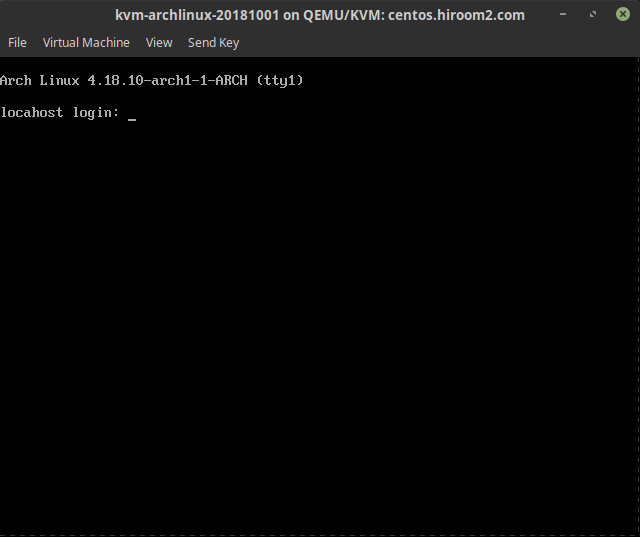 Automatically login as root user. You can use copy and paste on serial console. 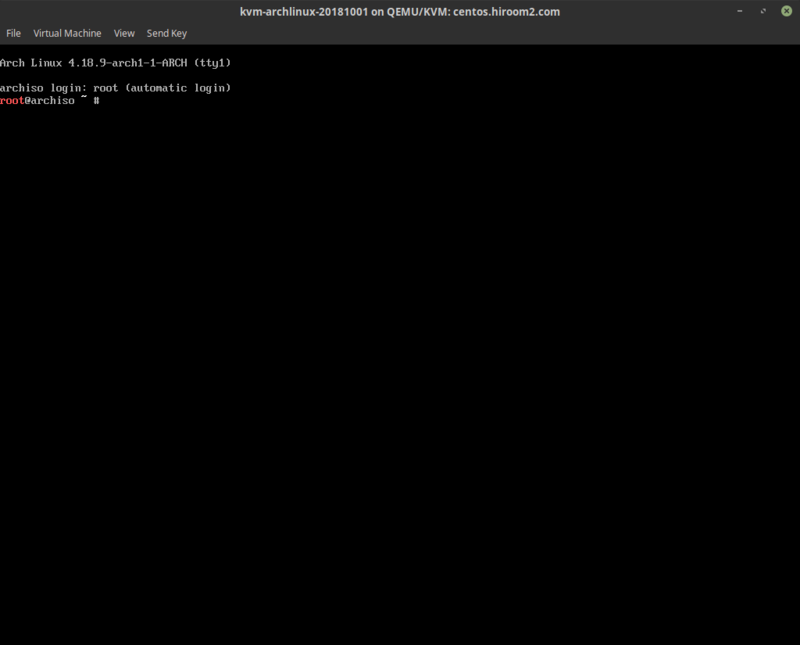 Because the bootloader in install media supports serial console, connecting to serial console outputs bootloader menu. Press TAB key and append "console=ttyS0,115200" to kernel parameter. And then press ENTER key. You can login with root user without password. This section will describe a configuration on LiveDVD before arch-chroot. /proc/partions before running fdisk are as the following. Change /dev/vda to your block device like /dev/sda. Welcome to fdisk (util-linux 2.30.2). Created a new DOS disklabel with disk identifier 0xae297af2. Create a partion for /boot which size is 256MByte. Created a new partition 1 of type 'Linux' and of size 256 MiB. Create a partion for LVM which uses rest of size. Created a new partition 2 of type 'Linux' and of size 9.8 GiB. Install base, sudo, grub, lvm2, openssh and haveged with pacstrap. 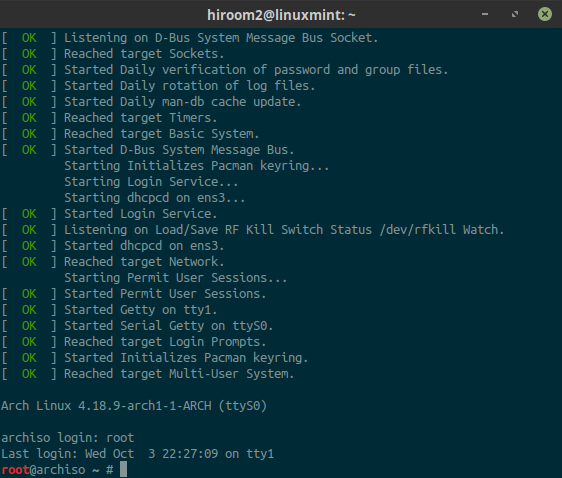 The openssh service waits for initializing random generator and haveged initializes random generator on boot. Enable dhcpcd.service and sshd.service. dhcpcd.service is a service for DHCP client. Create /etc/locale.gen and /etc/locale.conf. This article uses en_US.UTF-8. Add user to wheel group which can use sudo. 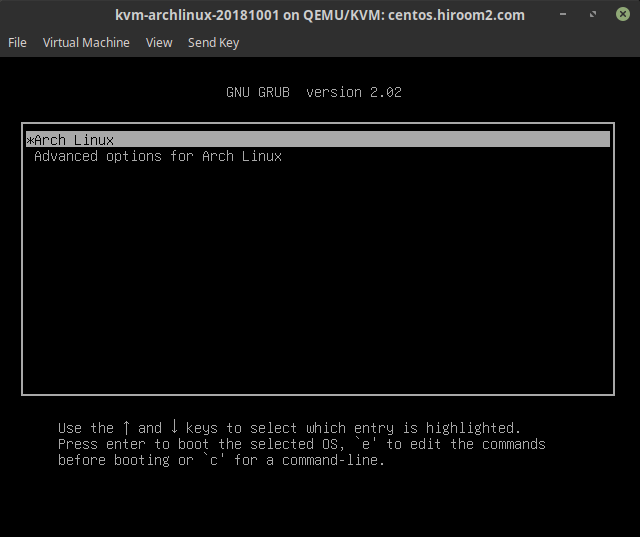 Install GRUB to /boot and MBR of /dev/vda. Login prompt is displayed. If DHCP server is running in your network, IP address is assigned with dhcpcd.